Lanka-c-News can now produce the written documents pertaining to the allegation against Sarath Fonseka over abuse of women that was first expose by this website. We post here a copy of the Martial Court document in which the judgment against Fonseka is written. Army Commander Cyril Ranathunga has signed as the deliverer of the judgment in this document dated December 1975. It has been brought to light that the MidFirst bank in Oklahoma is involved in sponsoring Gen (retired) Sarath Fonseka’s daughter Apsara Fonseka & son- in- law Danuna Tillakeratne for the Green Card. The hard working staff at MidFirst bank is very much distressed at the moment, because of the fact that MidFirst Bank and the immigration lawyer (Douglas Stump) handling the green card process for the Fonseka’s have not conducted an investigation or taken any legal action of the illegal activities of Danuna Tilakeratne, in spite of being well informed of Danuna Tilakeratne’s direct involvement in such illegal activities. They also have failed to provide information to Law enforcement authorities. Two H1 Visas extensions were granted to Danuna Tilakeratne by submitting false information to Home land Security as well as to the Immigration in USA through a company called Satpro Communication. In 2005, Satpro H1B visa for one Network Consultant/Specialist, salary $17.05 hourly good from 10/2005 - 9/30/2008. Address 5850 NW 50th St, Oklahoma City. In 2008, Satpro H1B visa for one IT/Network Administrator, salary $33,696 good from 9/29/2008 - 9/28/2011. Address 5850 NW 50th St, Oklahoma City. Danuna Tilakeratne has given information stating that he is still employed at Satpro communication in Oklahoma City to his lawyer and the home land security. When we requested Satpro Communications and Danuna Tilakeratne to show us the banks details with salary information from satpro communication both parties failed to provide the requested documents. Apsara Fonseka (Wife of Danuna Tilakeratne and an employee of MidFirst bank) well aware of the fact that Danuna Tilakeratne was involved in illegal activities, as well as violated USA immigration law included Danuna Tilakeratne’s name in the Green card application sponsored by MidFirst bank as her spouse. It has come to our attention as members of the Sri Lankan Diaspora in Sydney that your remarks in the “Sunday Leader” regarding the fact that the final stage of the war has created risky situation to the people of Sri Lanka. Although you tried to clarify the remarks, it was too late to correct the facts as detrimental comments spread all over the world within a short period of time by damaging Sri Lanka’s image. We also noted your claim that the war against the LTTE was won due to your leadership as the Commander of the Army. Although we appreciate your leadership for advancing the army to the wining position, it is our opinion that your commanding position was heavily supported by the Air Force , Navy, Police and other military forces together with other national and international forces which were in place, without your knowledge as the Army Commander. According to the structure of the Department of Defence in Sri Lanka, it is a known factor that Secretary of the Department has a vital role in co-ordinating all forces under the ministry and providing necessary resources to the relevant areas. We believe that Gotabaya Rajapaksha provided strong co-ordinating leadership at the war providing all necessary resources including aircrafts, ships, vehicles and personals through his department under guidance of President Mahinda Rajapaksa as the Minister for Defence in Sri Lanka. The credit for the victory in defeating terrorism should go to all who worked together at that time including members and leaders of all forces including yourself, secretary, president members of the international community as well. 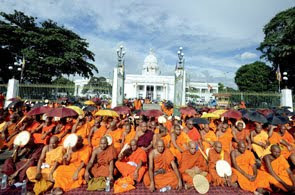 Sri Lankan Buddhist monks take part in a demonstration in Colombo yesterday in support of the incumbent President Mahinda Rajapakse in the presidential elections to be held in January 2010. The monks support Rajapakse in his fight against his main challenger and former army chief General Sarath Fonseka, whom they allege is an agent of foreign forces. Dec 29, Colombo: Adding to the political drama in the run up to the presidential elections, former Navy Commander is claiming damages from the former Army commander for defamation. Former Navy Commander Admiral Wasantha Karannagoda has sent a letter demanding 500 million rupees in damage for defamation from the opposition presidential candidate and former military chief General Sarath Fonseka, the Government Media Unit reported. The former Navy Chief says a statement made by the former military chief at an interview with a private television channel on the 24th of December 2009 is per se defamatory of him. According to a report by the Government media, in the letter of demand sent to General Fonseka, Admiral Karannagoda has claimed that a remark made by the General about him was malicious and has in fact tarnished his good name, reputation and public image, thereby causing him irreparable loss and damage. The demanded sum of Rs. 500 million should be paid within 14 days and in the event of failing and/or neglecting to pay and settle the said sum legal action will be instituted against General Fonseka to recover the said sum, the letter said. It has often been reported that the former commanders had personal rivalries and did not have an amicable relationship during their tenures. •What did the UN do when LTTE ethnically cleansed tens of thousands of Muslims, repeatedly massacred thousands of poor Sinhala and Muslim villagers? •The process of mapping LTTE assets by the international intelligence community is nearing completion and the process of acquisition will continue in the next few years. •Merchant Vessel (MV) Princess Christanta was acquired from an Asian country by a special team dispatched by Secretary Defence Gotabhaya Rajapaksa. •The government and the parliamentary opposition must unite to dismantle the LTTE international network. •To sustain peace in Sri Lanka, Ponniah Anadarajah, a double accountant needs to be tracked and detained. Q:UNP MP Palitha Range Bandara last week challenged the government to provide proof about the vessel “Princess Christanta,” to confirm whether it was really an LTTE vessel or belonged to a private company. He claims that he had information about the vessel as one that had been purchased in Jakarta, Indonesia, through the mediation of a Sri Lankan Naval Officer. How do you compare these allegations with information available to you? In case Sarath Fonseka is defeated in the forthcoming Presidential election, there is a plan to take over the country by force, it is reliably learnt. The Contingency Plan - 2, that has now come to the fore, is to be put into operation just immediately after the elections results are announced on 27th January 2010, reliable sources say. According to the plan -2, faithful soldiers are to surround the Temple Trees, the official residence of President Mahinda Rajapaksa, arrest the President and take him to a secret hideout. Also the plan includes a move to arrest and mercilessly kill Gotabaya Rajapaksa, Defence Secretary and other members of the President’s family. Once the country is taken over in a bloody coup, those Army Attaches who are posted in several Sri Lankan Embassies overseas will assume position as Country’s Ambassadors and negotiate with America and European Union countries for the recognition of the new regime that took over the country. As prelude to the bloody take over report emerging out of Colombo, it is revealed that Janatha Vimukthi Perumuna, the Marxist oriented pro-Sinhalese party has completed the first round of the house to house campaign in support of Sarath Fonseka’s candidature on one side and also gauged those who remain confidential to him, by meeting the retired Army soldiers, deserters, volunteer force members and one third of the regular soldiers. The China Radar deal punctures the claim. In fact, the deal also raises several serious questions, which the former army chief alone can reply. 1. What was the rationale to reject the Raytheon offer to refurbish the existing radars? 2. Did any technical committee evaluate the Raytheon offer? If so, was the offer found technically sound? 3. Did Raytheon guarantee that after refurbishment the ANTPQ -36 radars would get fresh lease of effectiveness? 4. What was the justification to go in for China radars? 5. Was there any technical evaluation before the government signed a deal with the Chinese supplier? 6. Was the army or government aware of the presence of middleman, Hicorp, a company of army chief’s son-in-law? 7. Did the Chinese radars function effectively during the Wanni War? 8. Did the CID question Danuna Tilakaratne in connection with radar and other deals where in he and Hicorp figure? General Fonseka - has to answer our questionsBy now it has become a set routine for Presidential candidate Sarath Fonseka to deny any wrong doing as army commander. But his every denial prompts Asian Tribune to dig deep into his past and unearth something to unsettle him. Yet, instead of offering his side, the retired general goes into an overdrive to run down Asian Tribune in interviews to various Sinhala publications. Why he is not coming forward to articulate his denial in the Asian Tribune itself remains a puzzle. Is it because politicians don’t generally like to send a rebuttal to publications as the editors have the inherent right to put each sentence of the denial under a microscope and juxtapose the denials with the original allegations. Media pundits and commentators aver that the former army chief is not serving his own cause by not using AT columns to put forth his side. The non-denial through Asian Tribune is not a disincentive to AT though. Sarath Fonseka has been made the presidential candidate only after he submitted an affidavit revealing all true information regarding war to the US State Secretary on Southeastern Asia Affairs Robert o’ Blake. He has handed in the affidavit secretly to Blake as he visited US recently. He has revealed certain facts regarding some incidents that took place during that period. He has given false definitions to many incidents to show them as true. US has now handed in a copy of this document to UN. UN has reportedly taken action against the Defense Secretary Gotabhaya Rajapakse and Major General Shavendra Silva based on a press statement of Fonseka in this backdrop. We are to receive more secret information soon and we will release a copy of the relevant affidavit in due course. Rights (PHR) has renewed its call for a criminal probe in the wake of a major New York Times story with new evidence that the Bush Administration impeded at least three federal investigations into alleged war crimes in Afghanistan in 2002. PHR is calling for Obama administration’s Department of Justice to investigate why the Bush administration impeded an FBI criminal probe of the alleged Dasht-e-Leili massacre. According to US government documents obtained by the PHR, as many as 2,000 surrendered Taliban fighters were reportedly suffocated in container trucks by Afghan forces operating jointly with the US in November 2001. The bodies were reportedly buried in mass graves in the Dasht-e-Leili desert near Sheberghan, Afghanistan.